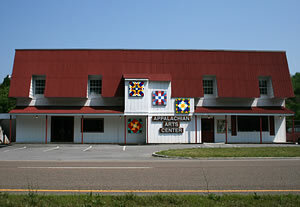 Appalachian Arts Center, is located 2.5 miles south of Claypool Hill on US 19. The Arts Center serves as both an exhibition space and a marketplace featuring the work of local crafts people and fine artists. Experience the beauty and artistry of handmade musical instruments, pottery, quilts, beeswax, candles, hand woven baskets, hand-crafted wooden toys, blacksmithing, jewelry and fiber arts. Original watercolors, oil paintings, and photographs, as well as unique small scale brick sculptures are also represented. Additionally, a series of artisan demonstrations and workshops provide the public with opportunities to gain insight into the creative process. Between Friends Gift Boutique is located at 998 Ben Bolt Ave, Tazewell, Virginia. Between Friends has a wide variety of specialty items, including a large selection of handmade fine arts. Locally owned and operated, between friends is the hub of the Tazewell artisan community. This cozy boutique is the host of the acclaimed Celebration of the Arts, held annually the first weekend of October. A great place to get a personalized gift, as they are also experts at monogramming your purchases (available for fabric products only).